Jesus came to set us free from condemnation, judgment and the burden of the Old Testament law. If you’re looking for a church where you can walk in freedom, free from the legalism of the old covenant, Crossfire is the church for you. We have a prophetic edge, vibrant worship, challenging teaching and freedom to walk according to the leading of the Holy Spirit. Come and visit us this weekend near South University Blvd. and Arapahoe Road in Centennial. We are excited to see you! 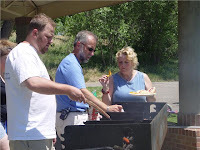 Pictured: Pastor Harvey (center) grilling at the Annual All-Church Picnic.